The blackberry plant produces an aggregate berry with single-seeded drupelets that tastes sweet and tart. Many other species of shrubs and trees also produce fruit that look just like blackberries but differ in classification, flavor, texture and development. For example, some berries within the same family while others are not berries at all despite the resemblance. Many trees produce fruit that resembles blackberries. The dewberry tree (Rubus trivialis) produces fruit that closely resembles blackberries. Dewberry tree is a woody trailing vine that shoots down roots at nodes. It has alternating leaves with three to five leaflets that range from oval-shaped to long and narrow. Small white or pink blossoms grow in March and April and are followed by dark blue or black drupelet fruits that mature in June and July. Dewberries measure from 1/4 to 1 inch long. They resemble blackberries except they are smaller and have fewer drupelets. Dewberries are edible and are commonly used to make jelly. The mulberry tree (Morus) and its various species -- white, black, red mulberry trees -- grows fruit that look like blackberries. The base of the mulberry blossom swells and develops into a round, succulent fruit. Each fruit resembles one blackberry drupelet, and the fruits grow in clusters. They are arranged so close together that they resemble a blackberry. Mulberries range from bitter to extremely sweet in taste. The color of mulberry does not determine the species. Rather, white, black and red mulberry trees all bear a wide array of colored fruit, from white to purple to black. 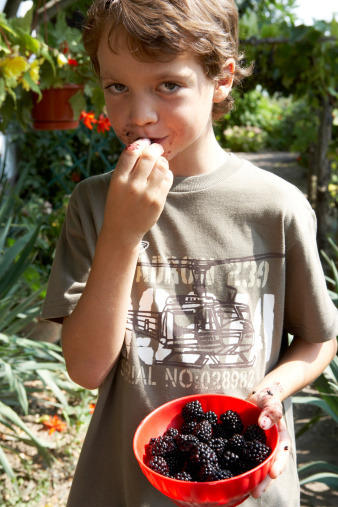 Mulberries are edible and ripen over time. The salmonberry (Rubus spectabilis) is a shrub or small leaning tree that grows up to 10 feet tall and 6 feet wide. This tree produces fruit that look like blackberries. Pink or deep purple single blossoms appear in early spring and are followed by juicy and tart berries that resemble the blackberry in every way except fruit color, which is salmon or pink. The fruit stem is golden and is slightly prickly. Salmonberries are edible but may be difficult to pick due to the tree's extremely dense thicket growth. Salmonberries are commonly eaten by birds.